I am contacting you because of my concerns about the toll on the George P. Coleman Bridge and how it has and continues to stifle growth in Gloucester County and others areas of the Middle Peninsula. 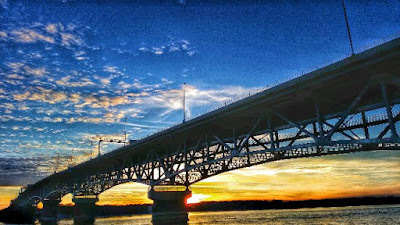 After considerable research and conversations with numerous people, I understand; when it came time to replace the bridge during the 90’s, there was a concerted effort, by the local governing bodies to our south and parties here in Gloucester, to prevent the federal government from becoming involved in the replacement process, to the extent that reinstating a toll on the bridge was the only option to cover replacement costs. I further understand; our southern neighbors’ objectives of reinstating a toll were to stifle the unprecedented growth that occurred in localities north of the bridge when the toll was removed from the old bridge. I further understand; our southern neighbors supported reinstating a toll to stop people from moving from those areas to the Middle Peninsula. I further understand; there were certain influential persons in Gloucester who wanted growth stifled because they want Gloucester turned into a retirement community. I further understand; some players wanted growth stifled until such a time as they too would be able to profit from growth in Gloucester. I further understand; if the federal government had been included, in the same manner as it was in the replacement of two bridges in West Point, there would not have been a need to implement the toll. When the Coleman Bridge replacement plan was presented to the residents of Gloucester, they were left with the impression that the toll would be required for 20 to 25 years. A year or so ago we were informed the toll will remain for another 20 to 25 years. Within the last few months Gloucester Supervisor, Phillip Bazzani has made efforts to have the toll restructured to relieve some of the financial burden the toll primarily places on Gloucester residents. I appreciate Mr. Bazzani’s efforts, but feel traveling the path through the Commonwealth process will result in minimal to no relief. Whether or not my understandings of how the toll came about are correct or not is basically dependent on whose version of the story one chooses to believe. There is one thing everyone seems to agree on; the swing span portion of the bridge is necessary only because of the Navy ships that navigate the York River. I am wondering what the possibility would be of moving legislation through Congress, in which the Navy pays off any outstanding debt and assumes permanent financial responsibility of at least, the costs of operations, maintenance and replacement of the span portions of the bridge; or better yet, of the entire bridge. If such a shift in financial responsibility occurs, there will no longer be any justification for the toll that has stifled growth in a large portion of the Middle Peninsula. It will also relieve the residents of Gloucester County and other affected localities of an unnecessary tax and restriction on travel. Thank you for the good job you have been doing and for your time. I thoroughly agree the time has come for removing the toll on the Coleman Bridge . . .I am confident a hidden agenda is the main reason the toll exists in the first place . . . I support removing the toll and believe this action needs to become a political agenda item . . . I agree, this issue needs to become an election issue on both sides of the bridge . . .